UPDATE: According to WDTV, one person is in custody after leading a pursuit that ended with 5 people being taken to the hospital over the weekend. According to the criminal complaint, the pursuit began when officers tried to pull over a car on Route 50 that had previously involved in a shoplifting incident. The car then went into the left lane and sped away from the officer. The pursuit began near the downtown Westbound and continued on Route 50 before the car took the West Pike Street exit and crashed into another vehicle. Officials identified the driver in the pursuit as 35-year-old Derek White. They say that while White was leading the pursuit, a pregnant woman was in the passenger seat begging him to stop. Four people were in the vehicle that White crashed into, including a pregnant woman. One person from that vehicle was flown to Ruby Memorial Hospital and the three others were taken to United Hospital Center by ambulance. The woman in the car with White was also taken by ambulance to UHC. Media reports have White as being from Wallace. During the incident, the Bridgeport Fire Department's EMS unit responded to the scene to assist. Click HERE for a little more information, the original story and updates if, and when, they become availalbe. 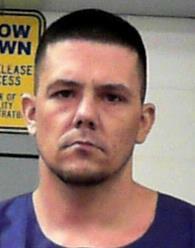 Editor's Note: Photo of 35-year-old Derek Anthony White from the West Virginia Regional Jail Web site.